Scientists have developed a system in which a human can control a rat’s movements using their mind, connecting a human brain to a rodent’s brain. Control instructions issued by the human brain were transferred to the rat via micro-electrical stimulation, according to a study in journal Nature’s Scientific Reports. During the experiment, six rat cyborgs were able to “smoothly and successfully” navigate a task inside a complex maze. The rats had been implanted with electrodes in their brains and whisker barrels in their snouts, before they were trained to associate the delivered stimulation with particular movements. The stimulations were transmitted through a wireless microstimulator mounted on the animal’s back. While a BBI between humans and rats was established in 2013, when researchers observed a human mind being used to move the tail of an anesthetised rat, this is the first time a BBI has been used to complete a complicated navigational task, according to CNet. 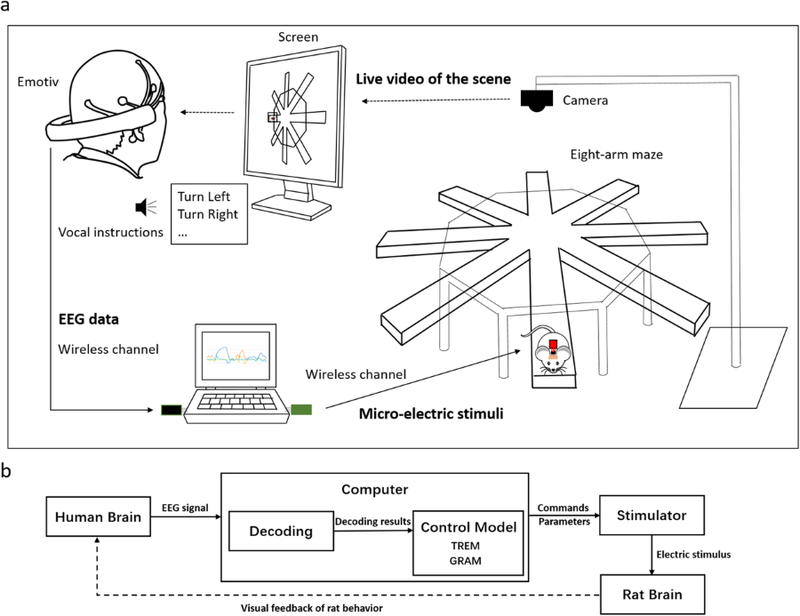 A human controller wore a electroencephalogram (EEG) brain-signal measuring device and thought about sending the rat left or right – or blinking to direct it forward. The movement information was sent to a nearby host computer which relayed the instructions to the rat’s back-mounted stimulator and instructed it to move through an eight-armed maze. “A trial was regarded as successful when the rat performed a correct turning and reached the end of the target arm,” the researchers noted. The system was tested further in a more complicated maze involving pillars, tunnels and a raised platform. The findings of the study “suggest that computer-assisted BBI that transmits information between two entities is intriguingly possible,” the scientists concluded, noting future experiments could allow for communication between two human brains.